Frostpunk Review | Nerd Much? 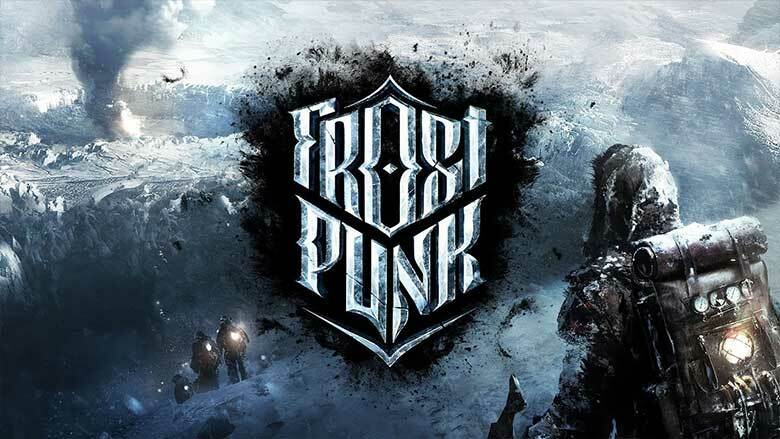 A review copy was provided for our Frostpunk review. Once in awhile, a game gets announced and unexpectedly checks all of the boxes. A unique idea? Check. The setting? Check. Awesome graphics? Check. And, that’s exactly the case with Frostpunk, the steampunk city-building survival game developed and published by 11 bit studios (makes of This War of Mine and the Anomaly franchise). 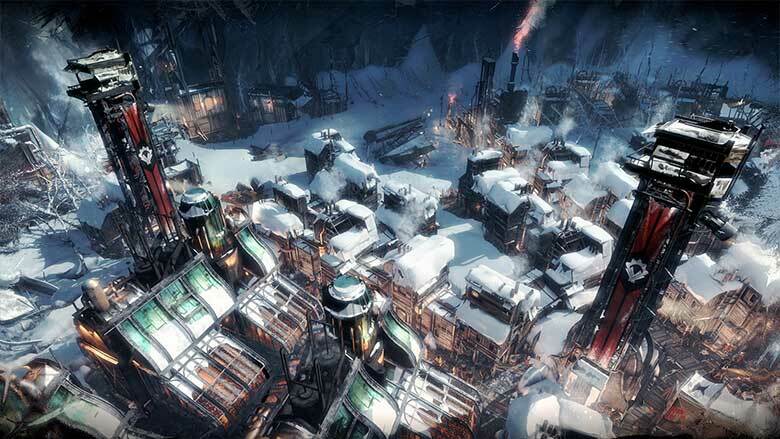 Visually, Frostpunk is stunning; the art style absolutely nails the whole steampunk aesthetic, with a little post-apocalyptic flavoring to boot. In addition to being well-suited to the Victorian-Era setting, the subdued palette also complements the undeniably bleak storyline. It was as though I could almost feel the cold right along with my settlement’s inhabitants. The buildings are all fairly detailed, although I wish players were able to zoom in further because the warm glow from the windows and lamps gives off a distinctly inviting aura. The soundtrack is also fantastic, picking up at all the right story moments to create a wonderfully tense atmosphere. The attention to detail is spectacular, right down to every person having a name. Right now, the game features the main story mode plus two additional scenarios, although they promise that more are coming soon. For the price of the game, I would have expected a bit more content on release, but what’s there is very enjoyable. The most glaring lack is a sandbox mode of some sort, or at least the ability to continue the main scenario beyond the last objective. You don’t really get a chance to fully explore the tech tree or play around with all the laws you can pass. This does force you to think a bit more strategically; you’ll need to formulate a plan and figure out which law branches and technological upgrades you’ll want to focus on, lending it a bit more replayability if you want to try out different strategies. However, once you’ve established a good one, there’s really no reason to play again. Each scenario offers an adjustable difficulty level; you can change the overall difficulty between easy, medium, and hard, or just tweak individual elements if you prefer. Easy mode makes resources a bit more abundant and your citizens a bit more forgiving, but still provides enough of a challenge that you’re never resting on your laurels. 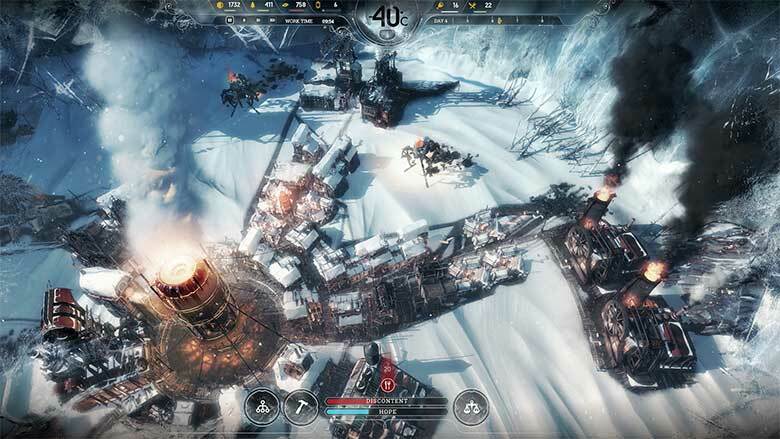 Frostpunk never really lets you get comfortable; just when you think you’re on top of things, the temperature might drop 20 degrees, or a disaster in your coal mine might put it temporarily out of commission. So if you’re looking for a relaxed resource gathering/city-building game, this is definitely not it – which I consider a positive, as there are enough of those out there. This one really keeps you on your toes. Virtually every decision you make in the game is a trade-off somehow. You have to give something to get something, so the challenge lies in weighing the pros and cons of each choice and trying to balance the needs of your little society. You might demand sacrifices of them that aid in overall survival, but that doesn’t mean they’re going to be happy about it. Virtually every decision you make in the game is a trade-off somehow. For example, there are children in the colony, which just sit around sucking up resources — unless you sign a law that enables them to work safe jobs, in which case you’ve just significantly expanded your workforce but also negatively affected hope and discontent (more on that later). Almost every decision comes with a downside of some sort, so you really have to think ahead and work to mitigate the consequences. It also means you’ll never have a flawless playthrough, which hurts the perfectionist in me a little, so you’ll have to get comfortable with that pretty quickly. I started over multiple times before I finally came to terms with this fact, and once I did, the game became significantly more enjoyable. Resource management is especially challenging because you are working with a limited workforce. It’s not like, say, Age of Empires, where you can simply materialize new villagers out of raw materials. You can recruit new survivors later, but it requires some research, building, and exploration to get to that point. You’re also confined to your little crater, and the resources there are finite, so you may need to send out explorers to scavenge for resources and establish outposts. Both of these elements add another layer of strategy to an already in-depth game. As far as the building aspect goes, it has a good “crunch”, and the process is very intuitive. The interface is very easy to navigate, for the most part. My one issue here was that there doesn’t seem to be any way to locate a specific type of building (or if there is, I couldn’t figure it out). This would have been helpful in situations where I needed to use a particular building’s ability or order extended shifts to get more work done, because all the buildings look relatively similar at first glance. That’s a minor inconvenience, true, but in a game where things can go downhill very quickly, those seconds spent looking actually matter. What really sets Frostpunk apart from other city-builders is that, in addition to taking care of your settlers’ physical needs, there is an emotional component as well. There are prominently displayed hope and discontent meters to measure the overall emotional well-being; if hope gets too low or discontent too high, they can and will overthrow you. There are various buildings that can be unlocked via the law branches and tech trees whose sole purpose is to affect these stats. You might be tempted to ignore them because they seem superfluous, but having these buildings in place enables you to get away with a little bit more in terms of harshness (like forcing citizens to eat soup rations or work extended shifts). In the end, Frostpunk feels like a breath of fresh air (albeit a chilly one) in a genre that’s now super competitive. Despite its few missteps like the inability to find specific buildings and the fact that it’s a bit too short, it’s a memorable experience that does a great job blending two genres together, being both a highly functional city builder and a survival game that actually requires you to care about your civilization. 11-bit’s attention to detail is outstanding, which not only shows through the game’s beautiful art style but also in how it handles every member of your civilization. And, the fact that it makes you have internal ethical conflict is the added wrinkle in gameplay that helps make it a wholly unique experience that shouldn’t be missed.